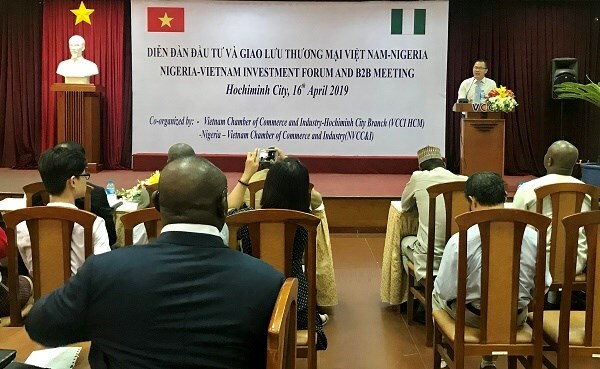 HCM City (VNA) - There is great potential for trade cooperation between Vietnam and Nigeria and investment in many sectors like agriculture, agricultural processing, garment, footwear, mining, and production of construction materials, a forum heard in Ho Chi Minh City on April 16. Speaking at the forum, Nguyen The Hung, Deputy Director of the Vietnam Chamber of Commerce and Industry (VCCI)’s HCM City Branch, said many African countries, including Nigeria, had become increasingly important economic partners of Vietnam. Trade between Vietnam and Nigeria has shot up from 250 million USD a year in 2012-2016 to 433.5 million USD in 2017, with Vietnam running a deficit of 303.9 million USD. Vietnam exports 52 items to Nigeria, including mobile phones and components, textiles, footwear, cigarettes and tobacco, plastic products, chemicals, machinery and spare parts, computers, and electronic devices. It imports raw cashew nuts, wood and wood products and cotton yarn, with the first two accounting for over 80 percent. “The Nigerian Government is implementing an Economic Recovery and Growth Plan (ERGP) in 2017 - 20 to create inclusive growth in the economy by improving human capacity, promoting economic diversification, investing in infrastructure, and building a globally competitive economy,” he said. “To deliver on the vision of this economic programme, the Government is executing critical reforms which have unlocked a lot of investment opportunities and we invite you today to take advantage of the investment opportunities in the ERGP,” the official added. “Nigeria’s trade with Vietnam is characterised by primary commodities, mainly cashew nuts and wood. However, we strongly believe that this can be improved upon and expanded to include other processed commodities and manufactured goods in line with the developmental aspirations and economic policies of our countries. “Fortunately for Vietnam, it is strategically located in a region where it can take full advantage of recent technological advances in developing its own economy.